We’d love your help. Let us know what’s wrong with this preview of Sylvia Plath Poems Chosen by Carol Ann Duffy by Sylvia Plath. Sylvia Plath was one of the defining voices of twentieth-century poetry, and one of the most appealing: few other poets have introduced as many new readers to poetry. Though she published just one collection in her lifetime, The Colossus, and a novel, The Bell Jar, it was following her death in 1963 that her work began to garner the wider audience that it deserved. The man Sylvia Plath was one of the defining voices of twentieth-century poetry, and one of the most appealing: few other poets have introduced as many new readers to poetry. Though she published just one collection in her lifetime, The Colossus, and a novel, The Bell Jar, it was following her death in 1963 that her work began to garner the wider audience that it deserved. The manuscript that she left behind, Ariel, was published in 1965 under the editorship of her former husband, Ted Hughes, as were two later volumes, Crossing the Water and Winter Trees in 1971, which helped to make Sylvia Plath a household name. Hughes's careful curation of Plath's work extended to a Collected Poems and a Selected Poems in the 1980s, which remain in print today and stand testimony to the 'profound respect' that Frieda Hughes said her father had for her mother's work. It was not until the publication of a 'restored' Ariel in 2004 that readers were able to appraise Plath's own selection and arrangement of her work. 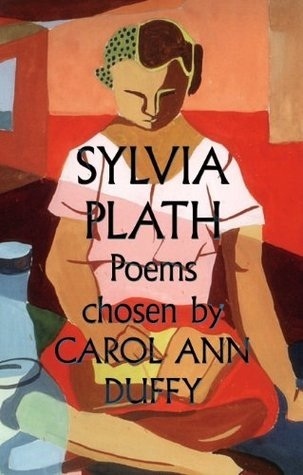 To ask other readers questions about Sylvia Plath Poems Chosen by Carol Ann Duffy, please sign up. Her works seem to find me in times where I question myself, question everything. I did like some of the poetry here, most of it I had read before in one way or another. "Event", "Poppies in July" and "Poppies in November" are the new interesting ones, alongside Lady Lazarus and Cut. Her style does not directly echo my tastes in poetry, nonetheless I did quite like the rhythm and non-consequential rule bending for some of them. Definitely one of my favourite books ever. I just love every poem she writes about the moon. Read Plath. Read Plath. She is sooooo good. A Class writer. Blah blah blah. I know why uni students study this because I needed a degree to understand what on earth she was going on about. I think modern contemporary poetry is more my thing. I did love "For a Fatherless Son" but other than that every poem just didn't make me feel anything. I can't really rate this one. Many of the poems I didn't like, or quite frankly didn't get, but there are a few that are absolutely transcendent. I was about to give up on Plath, but a few poems at the end made me want to try to understand her again. Absolutely wonderful poems by the late Sylvia Plath. She was truly a beautiful yet troubled soul and that is so conveyed in her poems. I love reading Plath's work, as it is something I can relate to on a personal level. Personal favourites thus far include "Metaphors", "Morning Song" and "Cut". My only conclusion after reading this book, is that poetry is probably not meant to be read, hurried through in a collection made by someone other than the poet, borrowed from a library to which it needs to be returned soon, hence the hurrying. Great set of poems, obviously - thoughtfully selected and introduced by Carol Ann Duffy. I reread and reread this and I'm so in love with her poetry. Personal favourite has to be November Graveyard but honestly I love all her poetry. Known primarily for her poetry, Plath also wrote a semi-autobiographical novel, The Bell Jar, under the pseudonym Victoria Lucas. The book's protagonist, Esther Greenwood, is a bright, ambitious student at Smith College who begins to experience a mental breakdown while interning for a fashion magazine in New York. The plot paralle Sylvia Plath was an American poet, novelist, and short story writer. Along with Anne Sexton, Plath is credited with advancing the genre of confessional poetry initiated by Robert Lowell and W.D. Snodgrass. Despite her remarkable artistic, academic, and social success at Smith, Plath suffered from severe depression and underwent a period of psychiatric hospitalization. She graduated from Smith with highest honours in 1955 and went on to Newnham College, Cambridge, in England, on a Fulbright fellowship. Here she met and married the English poet Ted Hughes in 1956. For the following two years she was an instructor in English at Smith College. Plath took her own life on the morning of February 11, 1963. Leaving out bread and milk, she completely sealed the rooms between herself and her sleeping children with "wet towels and cloths." Plath then placed her head in the oven while the gas was turned on.